Here is a much-awaited update on the little curlew migration. While we weren’t watching, the remarkable journey across the hemispheres has continued. Since the last update all four little curlews have made huge leaps towards their next destination – China. 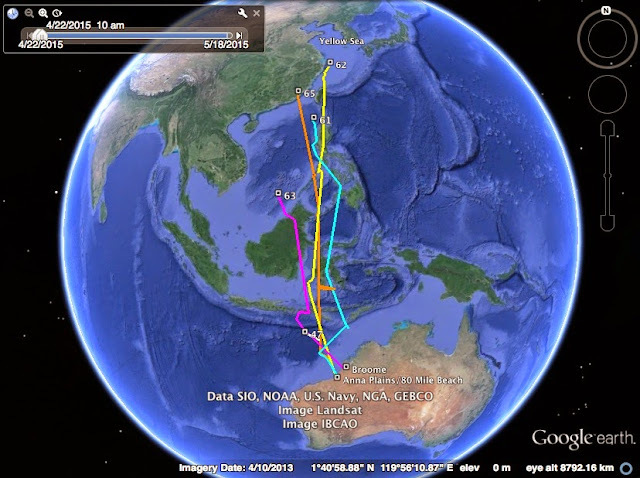 The birds have flown 3500 - 5500 km and two are about half way to the breeding grounds! In this update we provide detailed accounts of their journeys to date – interestingly, they are all very different. Little curlew 61, which departed from Anna Plains around the 24th April stopped over at Roti for about a week. It continued onto Sulawesi, Indonesia, and from there to Negros, Phillippines (~1400 km), where it appears to have made very short stop overs (approximately 2 and 4 days respectively). It looks like it had another brief stop, 200 km north east of Manila, before heading due north towards China. Another bird from Anna Plains (62) appears to have flown 3500 km in one go on the first leg of its migration. We think this bird left Australian shores on 27th or 28th of April and arrived on the tiny Cabunlauan Island of the Philippines on 30th April or 1st May (this island was erroneously referred to as Beni in the previous update). It rested there for just over a week and continued its northward migration with a brief stop 100 km north of Manila. It is currently tracking along the coast and over the sea, just east of Shanghai, China. Will it fly across the Yellow Sea without stopping? The Broome bird (63) has progressed the least on its northward migration, but has nonetheless covered some 3500 km since departing around the 26th April. It had a brief stop-over at Lombok, Indonesia, then moved onto the neighbouring Sumbawa for about 10 days. It was tracking over and beyond Borneo on its last transmission. Little curlew 65 initially travelled together with 61 for the first 500 km out of Australia. It stopped-over in Sulawesi for about a week and has just made it to the coast of China! It had another brief stop over of a few days on Palawan Island, Philippines. We had a bird stop-over on the same island in 2014. We’ll be able to tell you a bit more about the exact location of this bird after the next transmission, but for now, it looks like it’s between Shantou and Zhangzhou. We are eagerly waiting for the next transmission to see if the rest have stopped in China. We’re also wondering if these birds will make it to the breeding grounds. Last year we had a bird arrive there around 24th May. Keep a look out for more updates to find out!